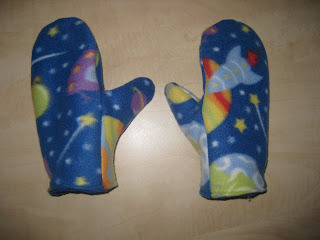 First, I examined the mitten I had & saw it was made from 4 pieces. I traced them and added an extra 1inch around them. I cut out 2 of each piece (reversing the sides so there'd be a left & right). 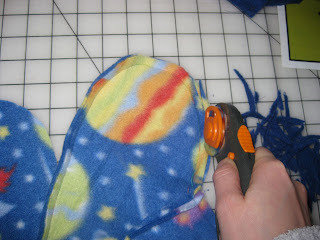 I wanted these to be extra warm so I cut out another set in a solid fleece to make a lining layer. 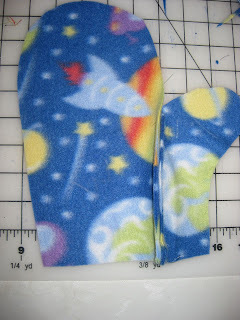 I marked the wrong sides on each piece so I wouldn't mismatch any (it can be hard to figure out front & back on some fleece) and then pinned the small thumb piece to the curved palm piece, right sides facing & stitched them together with a 1/2in seam allowance. 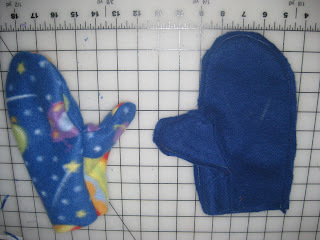 I did the same with the longer thumb & top mitten pieces. 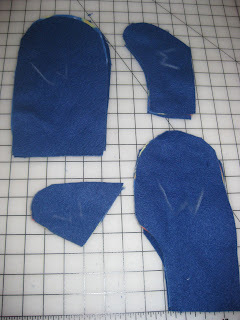 I then pinned & stitched the two halves together. 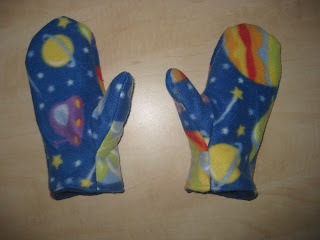 I did this for both hands and with both inner & outer fabric, so I had four "mittens". 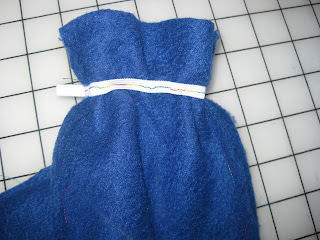 I trimmed the excess fabric so they'd fit together well. 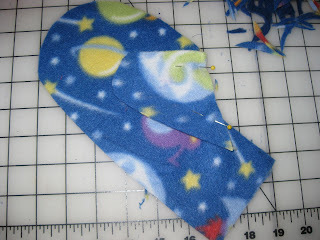 I opted for adding some elastic to the wrist of the wrong side of the inner fabric. I stitched it about 1 1/4 inches from the raw cuff edge. I used 1/4in elastic and cut pieces that were 1in longer than his wrist measurement and stitched it on, pulling it taut as I went. 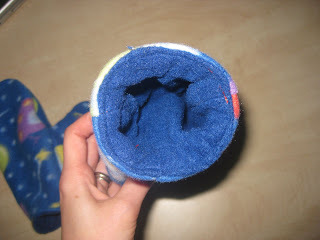 I turned the outer mittens right side out and fit the inner inside, so the wrong sides were together and folded in the raw edges and topstitched around the edge to attach them. All done! I literally had the idea to do this, worked out the plan & whipped them up in an evening, so not hard to do & well worth the effort: perfect fit, cozy warm, fun looking and cost nothing. What could be better? I've added this to Creative Cats at Poppies At Play and the SOYS Party at Fireflies & Jellybeans. Check out both great sites for more cool project ideas. Love the astronomical pattern! It's a great idea for stormy nights. Just in time for the FREEZING weather! This are so great! These would make a really stocking stuffer!! Thanks for the fun idea! Great job! I like that you added the elastic. What a great idea, love the lining idea!!! Love those....thansk for the pattern! May be making some!